You are here: Home › Container Conversion › Pop-up cafe made from a shipping container makes starting a business easier. 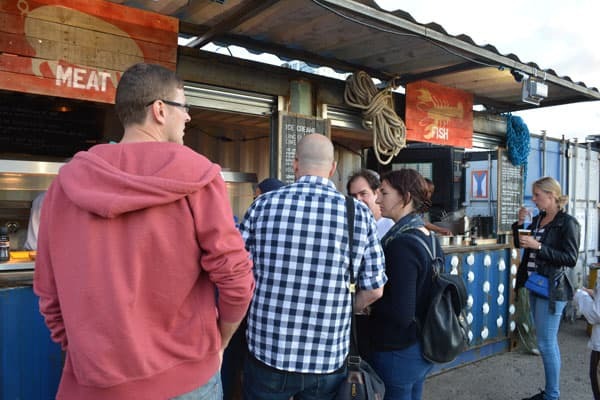 Pop-up cafe made from a shipping container makes starting a business easier. Why a pop-up shipping container cafe could be a better deal for entrepreneurs than a fixed location building. Location has always been a very tricky nut to crack for any business; but particularly so for cafe owners. Get it right and you have lots of footfall passing by each day letting you build up a loyal base of customers. Get it wrong however, and your cafe will quickly become a solemn place with your staff waiting around for customers, rather than waiting on tables. Even the best market research, which tells you how perfect a location could be still isn’t a guarantee. Getting the perfect spot for your business can be tough. With the UK restaurant industry worth an estimated £40 billion there’s plenty of opportunity and also profit to be made though. High initial cost. Large deposits, guarantees and advance rent all need to be paid up front, which can be a big drain on your cash flow! No physical assets – all of your rent is dead money. Lost capital from all of the fixtures and fittings that you need to make the cafe ready for customers. These can’t easily be pulled up and moved to a new location if you are renting fixed buildings. Unscrupulous landlords changing the rules of your tenancy agreement to their advantage, when you renew your tenancy with them. Inflexibility when it comes to special events and temporary opportunities. An additional mobile unit would be needed to give you a presence at a festival or attraction. 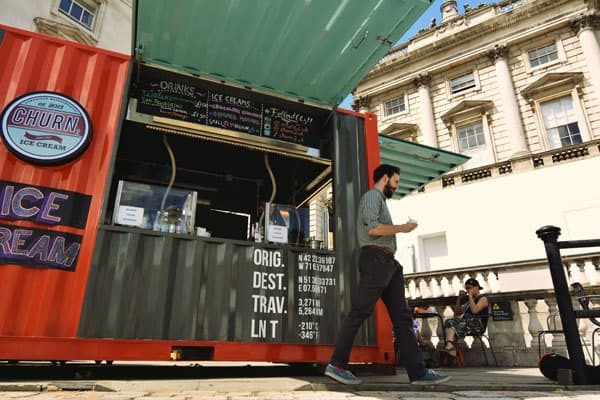 If a location doesn’t work out, you can simply move your cafe to another spot – you have a business in a box! It’s usually much less expensive to buy and outfit a container than it would be to do the same thing with a traditional building. It’s easy to increase the size of a container restaurant; all you need to do is add another container. 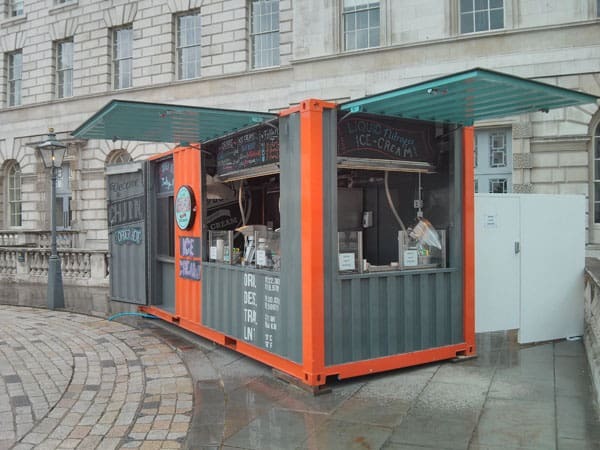 A container cafe looks unique meaning it will catch your customers’ attention instantly. 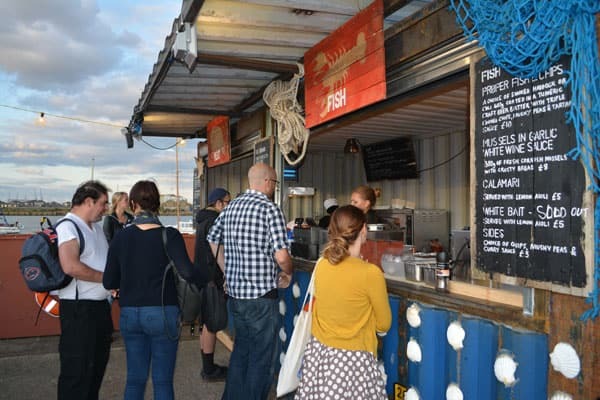 Even if your business is unsuccessful a pop-up container cafe has resale value, so whatever happens you own an asset that’s actually worth something . Rather than renting a fixed building, you would just need the land, which can save you money! Pop-up cafe’s provide a very attractive alternative to a traditional building for entrepreneurs, especially start-ups. 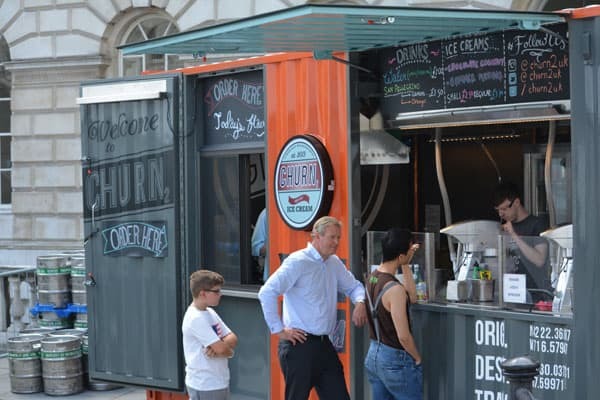 We have seen that pop-up shipping container cafe’s can be moved to any location whilst being customer-ready at a moment’s notice. They also allow you to sidestep high street landlords who could unfairly hike rent just as your business gets successful. A pop-up cafe might be your perfect opportunity to create a footloose presence in the hospitality sector, while protecting you from a lot of the high start-up costs associated with a fixed location site. So what’s going to be on your cafe menu? Editors note: Adaptainer converted the pop-up cafe / food vending container shown above and in the video but not the ice cream vendor unit displayed in this post. ← Help extend the life of your shipping container….. with a railway sleeper!